Stephen Westaby’s earlier Fragile Lives opened a door to a singular life - a pioneering heart surgeon who began his days on a council estate with precious few prospects. 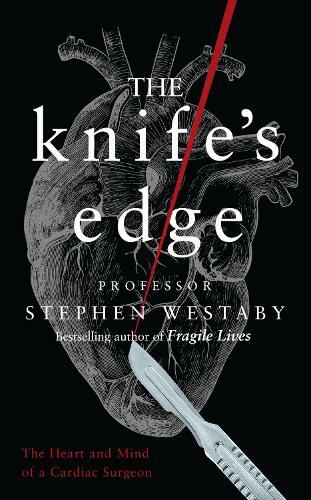 The Knife’s Edge takes us to the paradox at the centre of his practice, the balance of salvation and risk, told with all the anecdotal fireworks that made the original so compelling. For heart surgeons, the inevitable cost of failure is death and in The Knife's Edge, Westaby reflects on the unique mindset of those who are drawn to this exhilarating and often tragic profession. We discover the pioneers who grasped opportunities and took chances to drive innovation and save lives. Often difficult, uninhibited and fearless, theirs is a field constantly threatened by the risk of public failure. Like those before him, Westaby refuses to draw the line in his search of a lifetime solution to problems of the heart. His determination is unerring - a steadfastness underpinned by his unusual mind. But as we glimpse into the future of cardiac surgery, for all its remarkable scientific advancement, one question remains: within the confines of socialised medical healthcare systems, how can heart surgeons - individuals often hardwired with avoidance of self-doubt, a penchant for glory and a flagrant disregard for authority - truly flourish?